Busy times. Well, we finished the secretary to match the side tables. Adding the same paint and changing the hardware made them look like a matched set. While there was lots of tlc involved, it was worth it to not only save the money, but to find better constructed pieces than are currently available unless you pay an extremely high price. The Hemingway room is starting to look quite nice. We found the ship's wheel mirror on Amazon. Yes, sometimes you just can't find a bargain item and even I have to buy it new. What a shame! The key is though to save money every chance you get so that when the time comes that a bargain is not available, you will have the money to spend when it's needed. 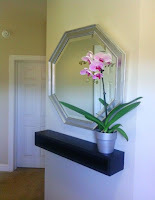 Take the front hall for example, I could have spent $400 for the mirror, around $200 for the floating shelf (solid wood), $20 for the orchid, $99 for the light fixture (or more), but I found a used mirror for $25, spent about $12 on the lumber for the shelf, got the orchid as a gift, and bought a light fixture for $10 at the restore and painted it (notice that the shape nearly matched the mirror). Nearly the same look for about $673 less. I love the way it turned out! Being that it's October 19th, we are having issues with frost here in the piedmont of North Carolina. We hurried out to pick everything we could before the frost. We ended up processing 6 gallons of sliced bell peppers, a five gallon bucket of Cayenne peppers (more than half strung to dry), ancho peppers, jalapeno peppers, the remainder of the basil (dehydrated and run through the blender), as well as two bushels of sweet potatoes. We have had the peanuts drying in the greenhouse, now it's time we pick those off the plants and replace them with the sweet potatoes to cure. We will never get bored here on this farm!